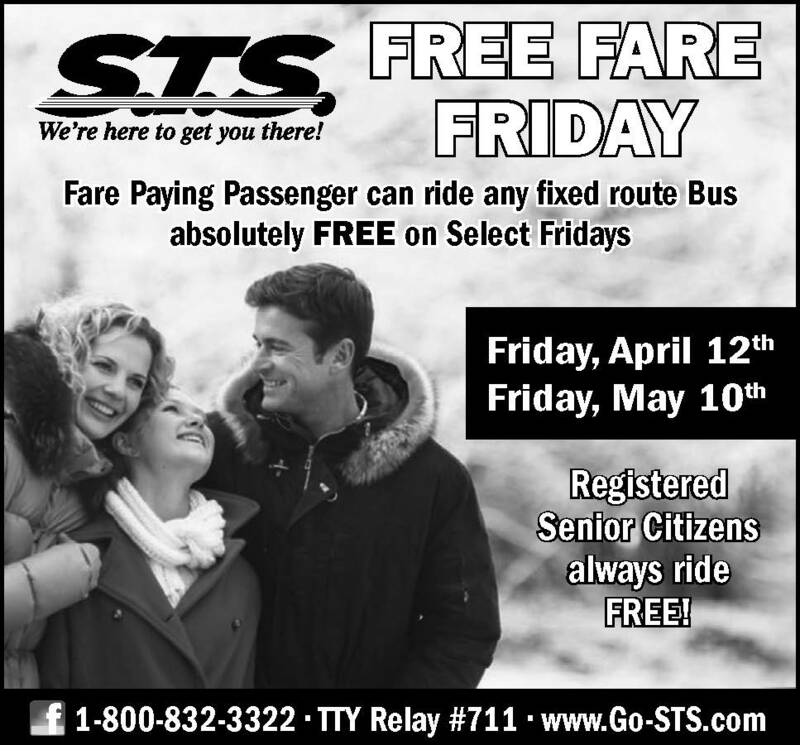 National Get on Board Day (April 25) -RIDE ALL FIXED ROUTE BUSES FOR FREE ALL DAY! Join STS on Thursday, April 25 as they celebrate with the American Public Transportation Association in recognition of National “Get on Board” day. “Get on Board” day is a new national awareness and advocacy day that is all about generating awareness of and increasing support for public transportation among riders and non-riders, elected officials, and stakeholders. A special drawing will be held for passengers to enter for a 30 Day Smart Card when they visit Union Station on Thursday, April 25 for “Get on Board” day! 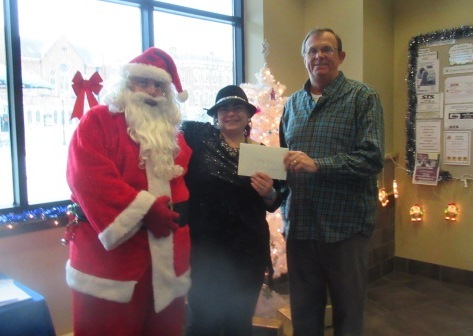 Continue Reading"PA Live: YCL New Schuylkill Transportation System App"
Pictured: Santa, Cathy and Dave Bekisz, Executive Director of STS. Congratulations to Cathy Bohn of Pottsville for winning a 30 Day Smart Card! given to Schuylkill Community Action for distribution to local food pantries. Dave Bekisz and all employees of STS want to thank “everyone” who donated to this worthy cause. 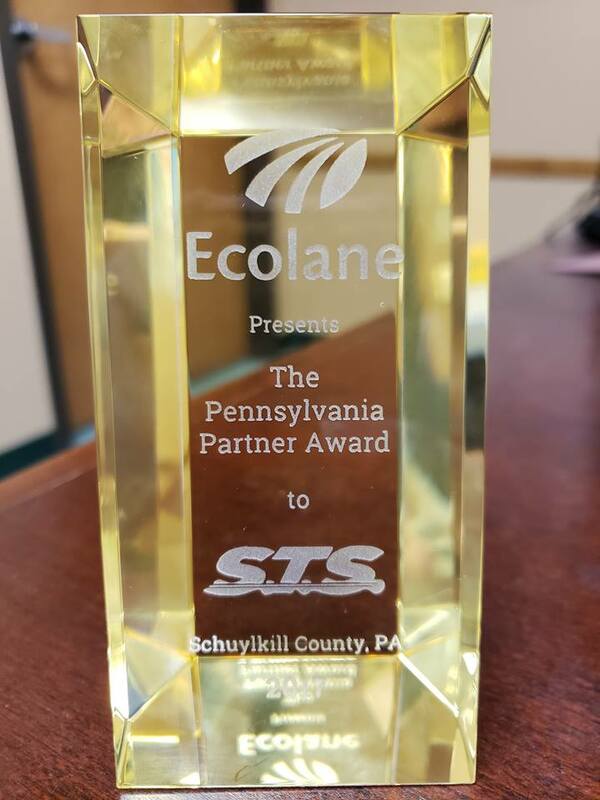 The Schuylkill Transportation System received the Pennsylvania Partner Award from Ecolane ranking STS as second in the state in several categories! Ecolane is a leading provider in demand-response dispatch and scheduling software in transit, paratransit, NEMT and government industries. 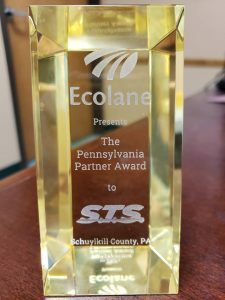 Shawn Schoffstall, STS Scheduler/Dispatcher and Krista Riedel-Yohn, STS Operations Systems Coordinator received the award on behalf of STS while in attendance at the 2018 Ecolane PA Partner Conference held at the Normandy Farm Hotel and Conference Center in Blue Bell, PA. Hop on one of our vehicles for your next group trip – We’re waiting just for you! 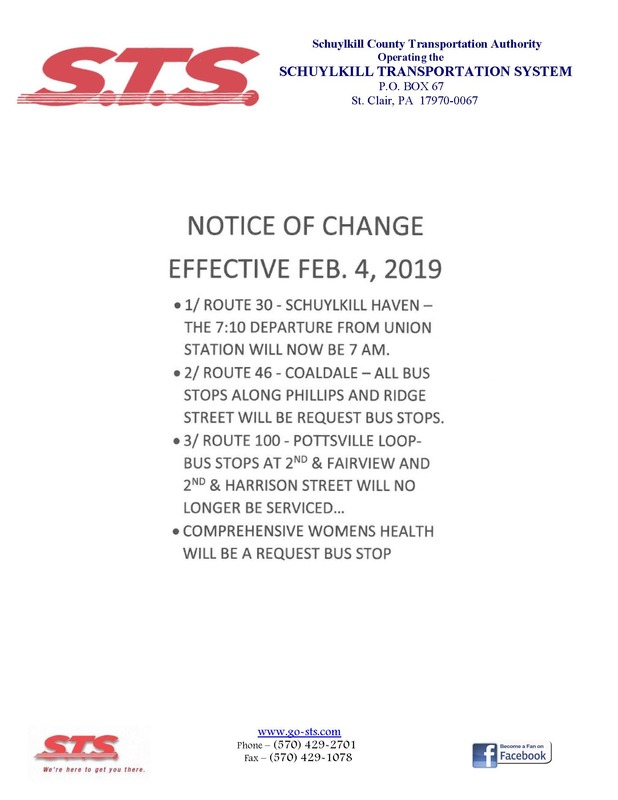 The Schuylkill Transportation System provides group trip transportation for registered senior citizens and persons with disabilities to destinations within Schuylkill County and limited out-of-county services to destinations within a 50-mile radius of the county borders. Destination choices are unlimited and some of Pennsylvania’s most visited attractions are within the service area of STS. Shopping outlets, malls, recreational facilities and quality dining facilities are just a few of the locations available to you! Service is available Monday through Friday with limited weekend service. Days and hours of service are: Monday through Friday, 8:00 am until 9:00 pm and Saturday from 8:00 am until 4:00 pm. 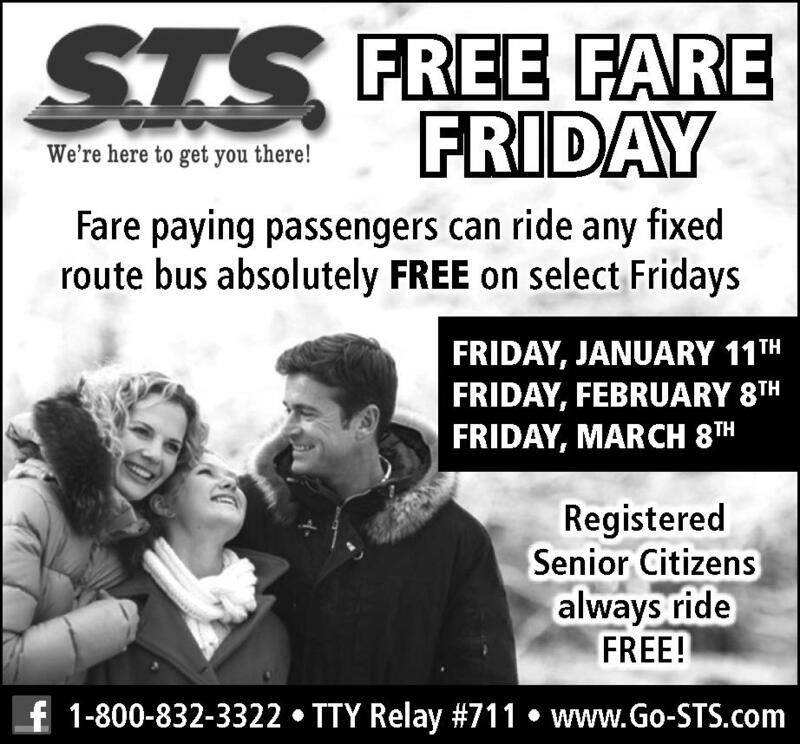 Fares are dependent on distance traveled. 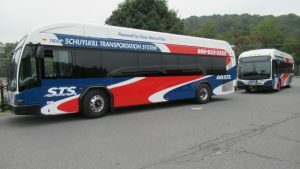 For more information on group trips and rates, please contact the Schuylkill Transportation System at 1-900-832-3322. *Don’t belong to a group? Check out the group trip information offered below and call STS for more info! 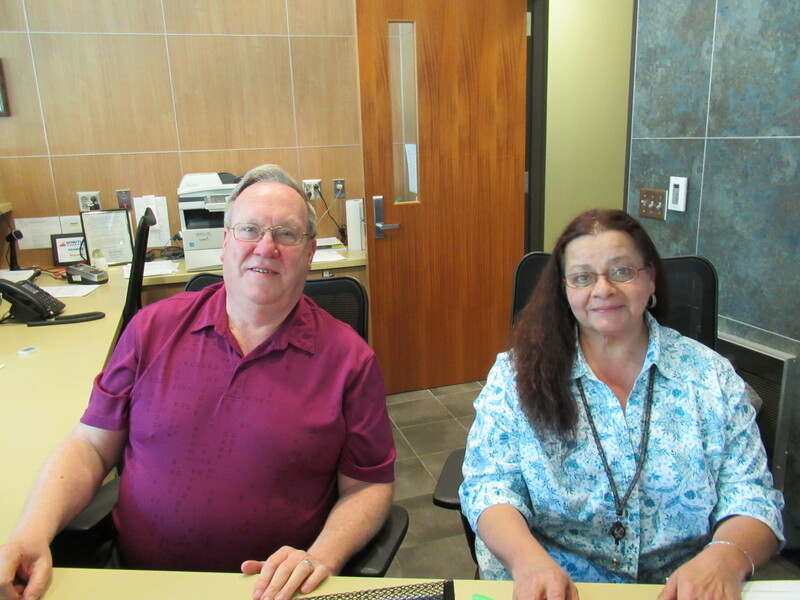 Customer service representatives Dave and Marianne would love to hear from you. Union Station Customer Service Representatives Dave and Marianne waiting for your call to travel with STS on a group trip. 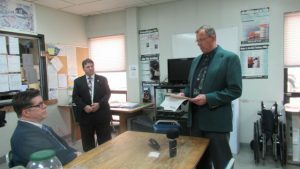 Executive Director, Dave Bekisz addressed attendees including Commissioners George Halcovage (seated) and Gary Hess (standing) along with members of the Press on October 24, 2018. CNG vehicles were on display at the St. Clair facility that day. 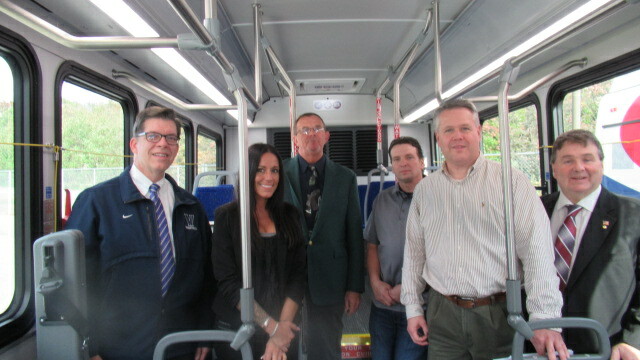 October 2018: The Schuylkill Transportation System (STS) is proud to introduce to the public five new compressed natural gas vehicles. 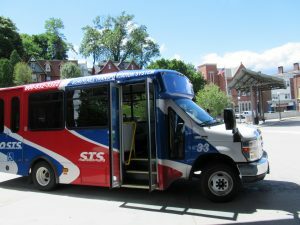 The vehicles acquired by STS include two 30 ft. and three 35 ft. buses manufactured by Gillig which will be utilized on the system’s ten fixed routes. These vehicle are to replace five diesel powered buses that have meet their useful life. Some of the many advantages of fueling vehicles with Compressed Natural Gas include reduced maintenance costs, expanding the vehicle’s life cycle, and promoting a greener environment by reducing less harmful emissions into the air along with less noise pollution. And since most natural gas consumed in the United States is produced in North America; resources should be readily available for many future generations. STS believes their passengers will also benefit when riding onboard a CNG vehicle since the sound level of a CNG engine is considerable more quiet than a diesel powered engine making for a more quieter and enjoyable ride. The Schuylkill Transportation System anticipates the acquisition of four more CNG powered vehicles in 2019. The Schuylkill County Transportation Authority is excited to join other State transit agencies by implementing these CNG buses to serve the residents of Schuylkill County and its visitors. Along with the advantages of CNG discussed above, these new vehicles are also equipped with many safety, reliability, comfort and IT advancements that will make them great assets for both our riders and STS staff. Side view of one of the five new CNG vehicles. Photo taken at the STS St. Clair facility. Dave Bekisz, Executive Director would like to take a moment to thank the many people and agencies that were essential for making this a reality. Thanks to the FTA, our partners at PennDot, local government, our Board of Directors and of course all the employees at STS. 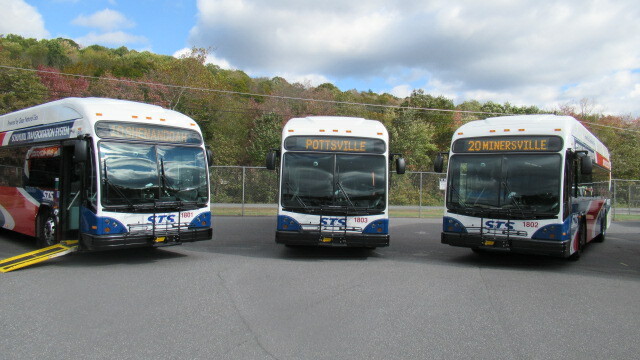 Three of the five newly acquired Compressed Natural Gas (CNG) vehicles acquired in October 2018 staged at St. Clair STS facility. 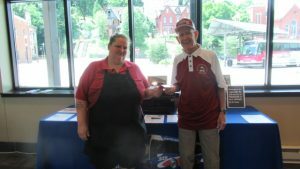 Frank Schuettler (Senior Citizen) of Pottsville donates his 30 Day Smart Card prize to Violet Murphy also of Pottsville. Thank you Frank and Congratulations Violet!